1901 census (it was the first to include a question on Mother Tongue). I found a total of 196 speakers, 91 of whom were born in Ontario. Of the 196, 21 were Protestant while the rest were Catholic. born in Ontario. Of the 74 speakers 44 were Protestant. is what I am most interested in. willing to pass them on to me and of course I would gratefully acknowledge it in any future publications. of then rural Osgoode Township. She spoke with strong traces of the Irish language. families who came here at the time of the famine, especially those who came from the west of Ireland. 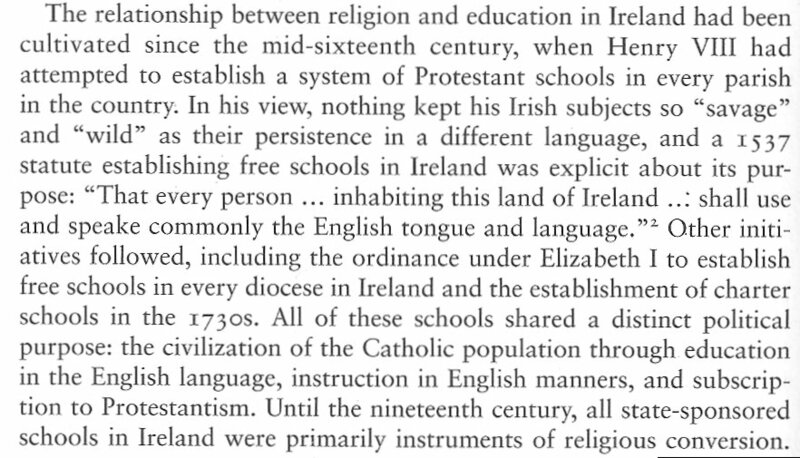 as persons whose Mother Tongue was Irish. from the rural area of western Ireland who came to the rural areas in the Ottawa area. geographical information. I think that it may be useful for your work. I will try and put together a list of relevant books and articles for you. (see also County Armagh, Ireland to the Ottawa, Canada area). "The unadulterated Irish language": Irish Speakers in Nineteenth Century New York", an article in the June 13, 1857, issue of Harper's Weekly. generation in Canada. Her grandparents, my GGGrandparents, both spoke Irish Gaelic on arrival in Ottawa in 1833.
percentage of Irish Gaelic speakers.